Have you moved often? I lived in the same house from the age of 5 until I left for university. Then, after graduating and getting married, we moved to Igloolik, Nunavut for 6 years, then here to Newfoundland. After two years here we bought a house up the road from our apartment and that has been the extent of my moving around. My husband, on the other hand, grew up as a pastor's kid, which meant they moved every couple of years. Moving to a new town means changing some of your routines. You have to figure out where the grocery store is and where you'll pick up your mail. Where can you go for a walk? Is there a beach nearby? Where will you go to church and how will you meet new friends? Our move from the apartment to the house covered a distance of less than half a kilometer, so it didn't change any of those things, but it did change the route for most of our walks and the new backyard offered more freedom to garden and play. Spiritually speaking, those of us who believe in Jesus have all moved, and not only from one building to another, or one province or state to another. The moment we accept Jesus' offer of eternal life through faith in Him, we make an inter-kingdom move. "For he has rescued us from the dominion of darkness and brought us into the kingdom of the Son he loves, in whom we have redemption, the forgiveness of sins" (Colossians 1:13,14). Though our physical bodies stay in the same place, shopping in the same stores and following the same route to get to work, our spiritual selves are somewhere completely new and this requires changing some routines. "Put to death, therefore, whatever belongs to your earthly nature: sexual immorality, impurity, lust, evil desires and greed, which is idolatry. Because of these, the wrath of God is coming. You used to walk in these ways, in the life you once lived. But now you must also rid yourselves of all such things as these: anger, rage, malice, slander, and filthy language from your lips. Do not lie to each other, since you have taken off your old self with its practices and have put on the new self, which is being renewed in knowledge in the image of its Creator" (Colossians 3:5-10). When we move our routines change out of necessity. Even if I still wanted to check my mail at the post office in Igloolik, I can't. I'm in a different province and my mail isn't sent to Igloolik anymore. Unfortunately, the routines that need to change because of our spiritual move don't become impossible. Though things like lying, gossiping, envying and greed have no place in this new kingdom, it is still possible that believers will slip back into those habits. It requires a constant vigilance, and a constant reliance on God, to break those old habits. Thankfully, God is more than willing to help us break the old routines and to form new routines. How will we know when the new routines are forming? "The acts of the sinful nature are obvious: sexual immorality; impurity and debauchery; idolatry and witchcraft; hatred, discord, fits of rage, selfish ambition, dissensions, factions and envy; drunkenness, orgies, and the like" (Galatians 5:19-21). Equally obvious, "the fruit of the spirit is love, joy, peace, patience, kindness, goodness, faithfulness, gentleness and self-control. Against such things there is no law"(Galatians 5:22, 23). Is there idolatry in your life, something that has a higher place in your heart than God has? Is there hatred or selfish ambition? That would be evidence that you are still clinging to the habits and routines of the old kingdom. Is your life marked by love, joy, patience and self-control? 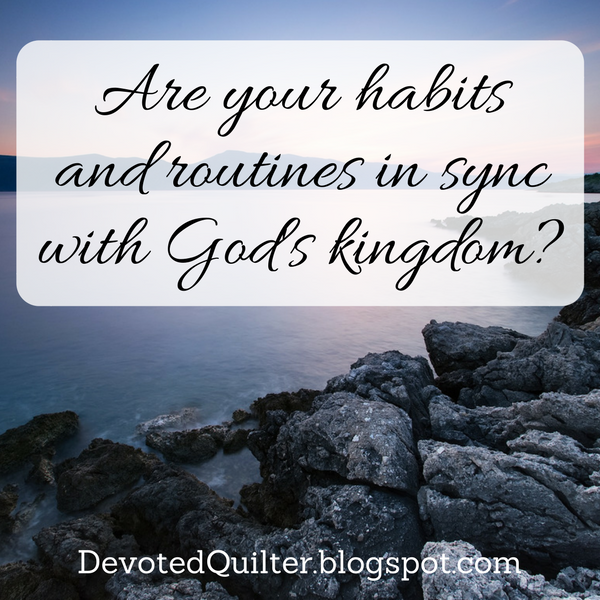 That would be evidence that your habits and routines are in sync with the new kingdom. So, if you're being honest with yourself, which kingdom has your allegiance, according to your actions? That's an awful lot of questions all at once! I will have t think about it a bit. Scrappy Log Cabin - Finished!! New Quilt Blogger Blog Hop - Week 3!